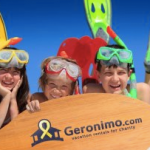 It has been a while since we heard from you, but we’ve been busy, so we hope that you will visit Geronimo or TravelPledge (our new website to have fun and help great causes) soon. In fact, we are now featuring $6,852,875 in fun experiences (golf, vacations, cruises, etc) that you can enjoy and generate a nice donation at the same time, and we have built over 4,100 private label websites for non-profit organizations. So it’s easy for these non-profits to raise money by simply encouraging their supporters to go have fun. For Non-Profits: Go to TravelPledge to learn more and get started. Our solutions make it easy to get fun experiences for your next fundraiser, and as a bonus we’ll build you a custom branded fundraising website for your organization to promote to its donors. For “Fun Lovers”: You’ll love the growing list of ways we let you do that and help your favorite cause at the same time. To raise money for your cause, wouldn’t you rather play some golf or take a cruise (at great values!). And know that a huge portion of the money you spend is going to your favorite cause (up to 90% of the purchase price!). New Stuff: For several years, we’ve been developing technology to help non-profits connect with generous businesses. We now help golf event planners find the right courses for their fundraisers(BestOutings.com) and to help golf course managers manage requests from charities (OneSpareTeeTime). See all of our latest platforms here. Please take a moment to explore the new platforms and help us spread the word. Thanks in advance for your continued support.